Last week, I talked about what a genuine BDS victory might look like, and how we would know when it had come about. This has become an important issue since, in most instances when the BDSers sent out a press release announcing their most recent “triumph” (certainly any one that involved boycott or divestment decisions with a financial impact climbing above three figures), these announcements tended to be maddeningly ambiguous (read MSCI and the Quakers) or outright frauds (read Blackrock and HampshireCollege). Notice the total lack of need to have anyone interpret the political and financial decision of the State of New Jersey in this instance of genuine divestment. No single-issue partisan hacks were required to “explain” to us how we should interpret New Jersey’s action. And no spin doctors had to be on hand to read us the tea leaves regarding why the institution (in this case, the state) was doing what it was doing. 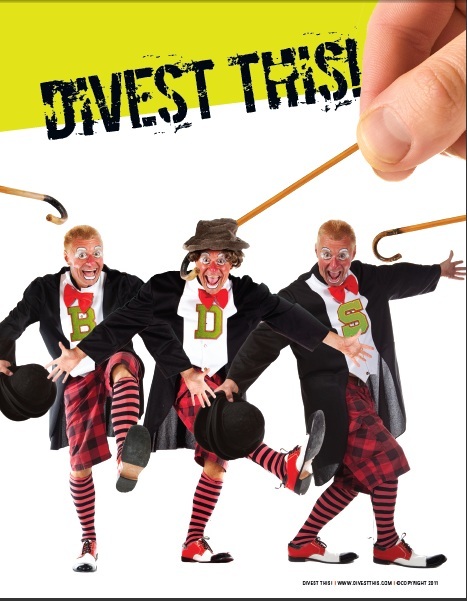 For when genuine, political divestment takes place, it is accompanied by a clear moral pronouncement by those actually doing the divesting which leaves no ambiguity whatsoever. In fact, since the type of divestment we’re talking about (selling stock for political vs. financial reasons) is a political act, the lack of an unambiguous announcement means such a political divestment act has not taken place. You don’t even need to go back two-and-a-half decades to see what I’m talking about. For during the BDS era, there have been other divestment projects (notably ones targeting Sudan and Iran) that have been wildly successful, even as anti-Israel BDSers ricocheted between defeat and fiasco. And this is just one example of statements just as clear as those made in the New Jersey or UMass cases noted above, except that this time they unambiguously state that the school has done nothing like what is being claimed by the BDSers. Keep these quotes and dollar figures in mind the next time the forces of boycott and divestment insist that votes taken by a student council somewhere (often taken in the dead of night behind the backs of students, which are immediately condemned or ignored by financial decision makers) mean victory is within their grasp. And keep it especially in mind when you are confronted by a BDS press release filled with unattributed quotes and ambiguous wording regarding what someone else was supposed to have done. And if said press release lacks a statement as clear as what we’ve seen with every genuine boycott or divestment victory in history, you can safely assume that this “win” exists only in the BDSers own heated fantasies. Mmmm hmmm. By definition, any institutional divestment decision will be publicized as such and will not need BDS to interpret it. The more I read on statements by the anti-Israel crowd, the more racist derangement I see. Whatever you do, don't mention Olympia! I think I did mention Olympia, although not directly. “victory” is a single food coop in a Washington State college town — a victory mind you that was the result of no consultation with the membership or membership vote of any kind. Hey Anonymous, I know Rome wasn't built in a day, but come on! For BDSers who want to see what an actual, effective BDS operation looks like– check out UnitedAgainstNuclearIran.com. Just about every week they announce that a company they have targeted has ceased doing business with the regime in Tehran, and the company acknowledges this in a letter directly to UANI. I don't think there's been one instance of a company contradicting UANI's statement that said company divested from Iran because of the behavior of the regime and/or the spotlight shown on them by UANI. Not to mention, of course, the number of states that have now adopted Iran divestment statutes. Interesting that nowhere in UANI materials is it suggested that Iran doesn't have the right to exist as an independent nation, or that its territory should be taken over and national self-determination for the Persian people be elimninated. Has the victory of victories on BDS already been mentioned on this site? By decree issued last May 22 2012, the French Highest Court of Appeals confirmed that public caalls for boycott of Israeli products constitutes “une provocation à la discrimination à raison de la nationalité”=”provocation to discrimination on the basis of nationality” and therefore does not constitute free speech. Let us not forget that France is where it all started with the academic boycotts led by among others Ilan Pappe and the late Tania Reinhardt and who has since gone to meet her maker (Satan). First off, Sylvia, while I agree with the message about France and BDS relative to free speech, the bit about Tanya Reinhart was over the line. She wasn't Bin Laden or even Greta Berlin, she was a biased academic who eventually found out Israel wasn't going to subsidize her hatred of the state when she was working at a public university, left for other pastures, and died. I didn't like her but comparing her Satan isn't appropriate. She wasn't the devil, she was just wrong and defeated and (should be) forgotten. Second, I simply don't understand why BDS advocates don't notice/admit that there's a huge dividing line between people supporting them or not. BDS has been a failure in an overall sense, but I have no problem stating it has had some victories–and in most of them, the boycotting party outright said that they were following the BDS line. And since we've seen THAT happen, why BDS does not admit that many more so-called BDS victories are not linked in any way to their goals and policies? It comes down to a “we know what people are really thinking and what they're really thinking is that they secretly agree with us” mindset that is both childish and self-defeating. So I welcome them to keep doing that. The question is what are their goals and policies? What does BDS seek to achieve? Do you know? Because I don't. If the goal of BDS is to bring Israel down to its knees, that won't and can't happen. All countries have here their representatives, their spies, their commissions, and they know full well there is no apartheid, but rather the stalemate of a peace program that they themselves imposed (the Quartet's road map, to name one). Is the goal of BDS to weaken Israel's economy? That won't happen either and they know it. In fact, a BDS success would have exactly the opposite effect – since there are Israeli companies would like nothing better than develop industries for which Israel depends on Europe and the United States. Is the goal of BDS to pressure Israeli society? To do what? Surely they do not expect Israelis to leave the country en masse – the overwhelming majority of Israelis are for the two states solutions, and it is clear to them that the stalemate is caused by the refusal of Mahmous Abbas to join the negotiating table. Is the goal of BDS simply to demonize Israelis and Jews an incite against them? Impose the Palestinian narrative throughout the world? It certainly looks that way. I spoke of a BDS legal defeat in France in my post above, but French BDSers have now taken their boycott to the “suburbs” meaning the agglomerations of Maghreban Muslim immigrants and they are distributing inciting pamphlets there. What corporations and economic interests in Israel do these poverty-stricken immigrant populations have? What is their leverage? None. The immediate goal is clearly incitement. But what is the long-term goal? This is where a thorough analysis must be done. Why do those Rabbis of JVP advocate for BDS? Does anyone seriously believe that it is because they are uniquely virtuous? Do you think the founders and signatories of the Jewish Fast for Gaza have any concern whatsoever for the victims of those they supports? Who among them has ever had a word of compassion for all those children and innocent civilians killed by Qassam rockets? No, what I see is that BDS is a coalition of different and even diverging interests taking a ride on the same train. Those who think that BDS has unified goals and policies are making a grave mistake. Voicing those goals would obviously divide and cause splits within the movement, which is precisely why they are not clearly spelled out. Sylvia– with all due respect, I disagree. BDS is very, very clear on its goal: the elimination of Israel as the state of the Jewish people. They try to hide this sometimes, to make BDS more palatable to gullible/uninformed individuals. But every time you press a BDS activist on the goals, every time you ask the ONE question that unmasks them (“Do you support peace between a Jewish state of Israel and an Arab state of Palestine?”) they have to acknowledge their ultimate purpose. Omar Barghouti, Ali Abunimah and others are VERY clear on that. That's why it's so important to keep asking them that question in every venue that they try to pretend that they are “peace activists”. OK. And what are the motivations and goals of the rabbis of JVP? Some of them are just as fanatic about BDS as Omar Barghouti. What are the motivations and goals of the Protestant Churches, some with a firm legacy of antisemitism going back all the way to their founders? Same motivation. There were anti-Zionist Jews before the establishment of the state and there are anti-Zionist Jews now. And though they are a minimal fringe they are a “man-bites-dog” phenomenon. Because they get to preface their statements with “as-a-Jew”. Also, for the churches as for the Europeans, they get to expunge their guilt over (in Europe) not speaking out against the Holocaust and (in the US) not speaking out to get our govt to admit refugees, and later to bomb the tracks leading to the death camps. After all, if Israel is just as bad, then they can make up for their failure to act FOR the Jews by now acting AGAINST the Jews. There were anti-Zionist Jews before the establishment of the State but they were across the Jewish spectrum: Reform, Orthodox, Haredi, and even assimilated Jews. But what we're seeing today is something entirely different. You must have heard by now of the letter of the 15 Church leaders to Congress – if you didn't see the link provided by anonymous above. A group of 13 Jews have signed a letter of support for this letter, 10 Rabbis, 1 cantor and 2 Rabbinical students. – are founders of and support the Fast for Gaza movement. How is it? I think it is important to know and urgent to find out. Where is the indoctrination taking place. I don't know, other than they all have in common the Reconstructionist Rabbinical College and that the Reconstructionist Federation knows of their activities. Yet, they are extremely careful not to implicate their denomination and prefer to pass themselves for “Jewish Rabbis”. Why?